Columbus is a feature I missed in 2017. It received the Independent Spirit Award for Best First Feature and got rave reviews (Metascore 89) and inclusion in a number of US film critics' ten best lists. It can be watched online via multiple streaming platforms. I'm now going to do so. I'll let you know what I think. Kogonaga is a South Korean-born American filmmaker previously known for short videos (often done for The Criterion Collection) - you can watch 16 of them on vimeo - celebrating the likes of Ingmar Bergman, Wes Anderson, Robert Bresson, Richard Linklater and Yasujiro Ozu. He is a particular devotee of Ozu and his pen name is drawn from the name of Ozu's screenwriter. Accordingly, Kogonaga's film is subtle and low-keyed to a fault and some of its images are framed as Ozu would. It takes place in Columbia, Indiana, incidentally the home town of John Pence, but significantly here a mecca for modernist architecture, with buildings by many of the greats of the style and guides regularly leading tours of them. The schools are by known architects. Even the rubbish bins are in tasteful harmonious colors. The film focuses on two randomly met people in limbo. Jin (John Cho), a forty-something Korean-American man now resident in Korea where he works as an English-to-Korean translator, has come back to the US for his father. Jin's dad , an architecture professor, had come to Columbus for a lecture, then collapsed and gone into a coma. An impromptu friendship develops between Jin and recent local high school grad and architecture buff Casey (newcomer Haley Lu Richardson). The two hang out and engage in a warm temporary friendship-flirtation while Jin awaits his father's death and Casey slowly works up the nerve to leave her ex-meth addict working-class mother and go away to college. Besides the dad in a coma and the mom who's always working, the impromptu couple formed by Jin and Casey is framed by two secondary, faintly romantic, links. Casey has an admirer closer to her own age, the charming, hyper-articulate Gabriel (Rory Culkin). They both work in the library, and he has a masters in library science. For Jin there is his father's colleague Eleanor (Parker Posey), also present, also charming, and someone he had a serious crush on when he was young. Memorable lines: "architecture has the power to heal" and "This isn't the movies. Nothing is going to happen." The acting is thoughtful and good, there's a harmony between the Ozu-style framing of figures and architecture and the calm pace, and there's an ambient electro score that fits. Casey lectures Jin on the architecture. The surroundings provide a meditative focus and her talk proves she should probably go to architecture school. Young Richardson more than holds her own with Cho, Culkin is charming, Posey is poised, and the architecture is an impressive additional character. I'd like to have had less cigarette-smoking and more of Rory Culkin and Parker Posey. A treat for cinephiles, but unlikely to appeal to a wide audience; and I felt kind of wide-audience as I watched, much though I love modernist architecture. I would direct viewers to a favorite documentary of mine, Nathaniel Kahn's My Architect , instead, arguably a more powerful film in both architectural and emotional, human terms. This film is reminiscent of Jem Cohen's Museum Hours (SFIFF 2013), also a first feature film by a maker of other kinds of films (non-commercial and highly original documentaries), also with someone visiting a beautiful town (Vienna) for someone who's in a coma, who likewise engages in a transitory romantic friendship, and a series of conversations, with a local. But Museum Hours seemed more mysterious and less calculated and controlled than Columbus. 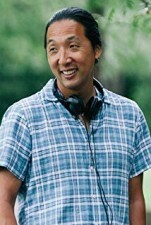 Nonetheless Columbus undoubtedly has its own unique vibe and establishes Kogonaga as a distinctive filmmaker. 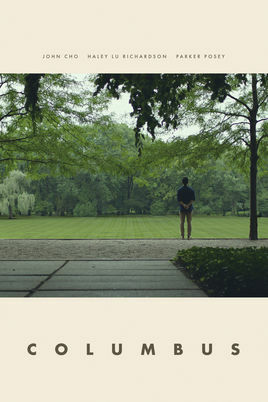 Columbus, 100 mins., debuted Jan 2017 at Sundance. Its US theatrical release was 4 Aug. 2017, to critical acclaim. Metascore 89. Last edited by Chris Knipp; 01-05-2019 at 02:39 PM.